If you use two different devices (i.e. a phone and your computer) or different apps to access your email and your email messages seem to disappear sometimes, you're not imagining things. They are being removed from your inbox. But you don't need to worry. There's an easy way to fix the disappearing email problem. There are multiple ways you can access email — logging into your account through a web browser on your computer, using an app on your smartphone, using a desktop app like Outlook. Depending on how you access your email, you're either downloading a copy of the email to your device and using it locally using a protocol called POP3 (Post Office Protocol 3), or you're keeping it in sync with all of your devices using a protocol called IMAP (Internet Message Access Protocol). It's when you use POP3 that you can get into a situation where email goes missing. Email services including Gmail, Yahoo!, Outlook.com, AOL, default to IMAP. So if you go through the automatic setup for your iPhone, Android phone or Outlook, you should automatically be set up for IMAP. 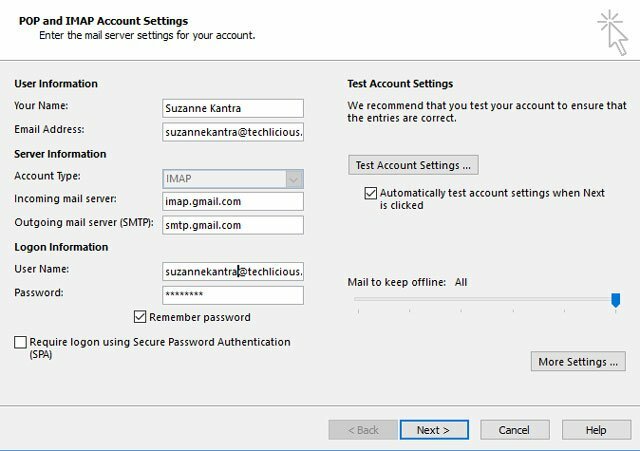 If you've had your Gmail account for a long time, you will want to double check your settings to ensure that IMAP is enabled. 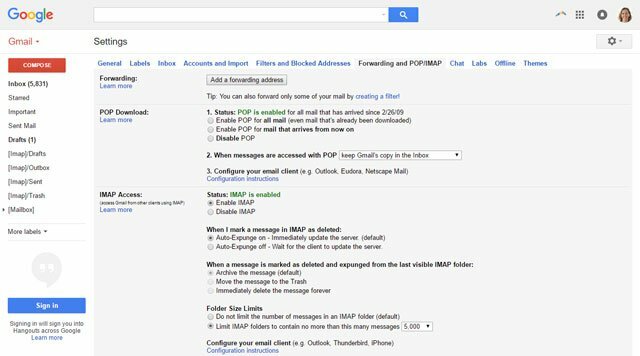 Log into your Gmail account through a browser and select Settings > Forwarding and POP/IMAP. If you are using another email provider or accessing your company email, you may be using POP3. You'll want to check your account and look at the advanced settings, which is an option in iOS, Android and Outlook. The incoming mail address will either start with "pop" or "imap". This is where you can change your account setting as well to switch. Think of POP3 like you would a real-life post office. I send you a letter, it arrives at the post office, the mail carrier delivers it to you and, so, the letter gets moved physically from me to you. If you or the mail carrier loses the letter, the post office won’t be able to give you a copy. With POP3, you can set your email program to automatically download new messages at specific intervals (e.g., every 5 minutes or once every 3 hours) or manually download them as you wish. All new messages are moved from the server (i.e., the post-office) to your email client or program (i.e., your mailbox at home). You cannot download just one message; it’s all or none. Once messages are downloaded to a device, such as your desktop at home, those very messages will no longer be accessible from another device, such as your mobile phone, because the messages have been removed from the server. That is unless you instruct the server to retain copies of your messages so that you can also download them on other devices, which is how your email is mostly set up. If you do set the server to keep copies of your emails, you can download them on your other devices, but each email will be treated as a separate email. So, if you delete one from your phone, the deleted email will still be on the server and on other devices that you downloaded it to. To truly delete email, you’ll need to delete it on every device where it was downloaded to. In addition, if you've organized your downloaded messages into folders and subfolders using Outlook, for instance, those folders will exist locally on your device only. To reproduce the folder structure on another device, you will need to do it manually. The main benefit of POP3 is that entire messages — message headers, body and attachments — are transferred from the server to your device allowing you to read your messages offline. This can be a cost-saver if you’re on a limited data plan or flying without WiFi. On the flip side, this can cause you some waiting time if you have a lot of new emails, especially those with huge file attachments. If your IPS limits the amount of email you can store on the server, POP3 may be the right choice for you. For as long as you regularly fetch your messages, you don’t need to worry much about running out of storage room on the server. The only limit will be your local storage space. But, remember that if ever your local storage crashes, all messages that you’ve downloaded to it will say goodbye along with it, unless you’ve kept backups. Unlike POP3, IMAP will download an entire message and its attachments (if any) only if you ask it to — that is, if you choose to read the whole message, or depending on your email program or app’s settings. Note that smartphone apps will fetch the whole email minus attachments. This download-on-demand flexibility can help you save on bandwidth. Also, unlike POP3, whenever you download a specific message from the server, the message stays on the server until you delete it. Only those messages that you choose to read or download are stored in your local storage. If your desktop or mobile gets bricked, you won't lose your email. Messages that you’ve marked as read in your email client will also be marked as read on the server and in all other email clients that access your IMAP folders. Folders and subfolders that you create or modify on one of your devices will also be synced to the server, which in turn syncs with your other connected devices. So you experience consistency regardless of how or where you access your messages. IMAP Vs. POP3: Which method should you use? Here at Techlicious, we strongly recommend IMAP. However, your emailing habits and needs may be different from ours, so your choice of protocol should match those needs. Why would you want to use IMAP? First of all, IMAP allows you to retrieve your messages on multiple devices — your smartphone, home computer, tablet, laptop and the like. Since the server stores your messages, you don’t need to worry about losing messages if one of your access devices fails. So, if ever you need to reformat your desktop’s hard drive, you won’t need to go through the process of backing up your local mail database and importing it into a fresh installation of your email software. Just set up your IMAP account, connect to the internet and let your email client sync the folders. Almost all servers also use mechanisms to keep your email data safe and secure, often by keeping redundant copies on multiple servers, so that’s additional peace of mind for you. One major tradeoff, however, is that the volume of emails that you can keep is limited to the server storage space configured for your account. Second, whatever modifications you make on one device will be reflected in all other devices that access the same IMAP account. For instance, when you read a message on your desktop, that same message will be marked as read on your phone, tablet etc. The same case happens whenever you delete messages, move messages to subfolders, create or delete folders etc. Third, you save on bandwidth because full messages are downloaded to your device only when you choose to. You get to see what messages have arrived and choose which ones to download and read. Retrieving the message headers happen relatively quicker than POP3, too, since only the headers are fetched. You do need to be online to be able to download full messages. Why would you want to use POP3? If you read your emails using only one device (for instance, a laptop exclusively for work use), POP3 may be a better option. All of your new messages will be downloaded in full at once to your device. In contrast with IMAP, you won’t need to be online anymore to be able to read any of the downloaded messages. As long as you regularly download your POP3 email, storage limits on your account should not be a big issue. Just remember, though, that all your messages are tied to your specific device, so make sure that your local emails are frequently backed up. Technology can be overwhelming if you’re not familiar with it. My recommendation is to keep things as simple as possible and find someone you know who can help you get things set up and resolve issues as they arise, such as your email disappearing. Horrible idea which is IMAP!!! Never use IMAP – this is your problem! Many people these days recommend it - but I am saying that if some body recommend it don’t know much about technology and has to go back to school! I need to find my e-mail. Until yesterday I had no problem. I look through all the problem solvers but I am not computer savvy. I ask for help and I am told to go the my e-mail to get items that should help. Well!!!! !, How can I do this when the problem is with the e-mail? I cannot not retrieve it and/or use it in any fashion. I just tried to let you know what my problem is. You return a error message saying this portion has not been completed. Once again, I cannot retrieve my e-mail. I have checked out what the problem may be. However, I am not computer savvy so none of the things make sense to me. Please help me with things with a simple way of retrieving my e-mail. Thank you. IMAP is really bad invention!!! Personally I can’t understand why everybody recommends IMAP even though it is really bad inventon. I am using extensively email for last 15years recently I realized that all mail apps offer only IMAP. I am using it for over a year on my iphone and I can’t understand why someone can recommend it! POP3 is not as explained above only for use on one device. You have access to the mailbox from all devices, when you open, you download emails to each device and can view it wherever are and whether you have internet connection or not (seatting on the airplane). IMAP let you access your email the same way from anywhere but if you delete it on one dewice it diapires from all devices and it is gone!!! If you try to find the email that you received few weeks ago you get the message that it does not exist. This is horrible. Try to change your email address everything is gone for ever. With pop3 I have emails from 10years ago and already referenced it several times. Many times my customers refer to the order few years ago and I have whole conversations and drawings from 5k customers. And now on my IPhone I am using outlook app with IMAP - can’t find emails from two weeks before. If your goal is to sync all of your emails (received, sent and trash) and their status (folders, read vs not read) across multiple devices, then IMAP is the only way to go. The fact that if you delete an email on one device, it deletes from all devices, is a good thing - much more efficient than having to delete the same message multiple times on your laptop, phone and web server. And if syncing your sent messages across devices is important, then you need IMAP. So IMAP is a really good invention. For most people, it’s the far better solution. But you always have the choice of POP3, if you prefer. You are right about syncing the devices and send items folder but the biggest problem is that you have to constantly work on archiving the emails and be very careful with deleting them, because it is permanent for all devices. For almost a year I was using Outlook on my iphone and IMAP is the only option there. This was horrible experience. On my work laptop I have all emails for last 10 years. And I can go back to it anytime. I understand that most people don’t need that but a year is a must. And this is how long I keep deleted folder. I don’t care when I delete Items because they are not despairing permanently. I understand that IMAP is perfect for kids where emails are not very important but in business you cannot rely on server and internet connection – if there is no internet you have no way to see your emails!! I don’t understand how somebody can take this risk. And it is even bigger problem when you have more than one person syncing to the same mailbox. I forwarded an email address from G-Suite to my laptop Outlook app and my iphone using IMAP. When an email comes in it will go to both devices. However, as soon as my Outlook app on the pc receives the email, it will disappear on the iphone. It does this without me opening the email on either device. I need to keep these emails on the iphone and pc. Is there a setting that will prevent the emails from disappearing from the iphone? Are you sure you're using IMAP and not POP for Outlook? If you’re using POP for Outlook, there is setting to “Leave a copy of the message on the server”. If this isn’t checked, Outlook will upload the message and then delete the original message from Gmail. Your iPhone will see the message deleted and then delete it on the phone. All of my personal information has been compromised. Who do I contact? Also, my wife and my whole entire families personal information has been compromised. Why are my messages in the Inbox disappearing? They are no where to be found. email coming in the system in the office but not reflecting in my android mobile phone? since jan 2018 everything was ok() afterwards emails are coming to my system in the office where as not my mobile phone? not able to recover it by seeing youtube sustems becuase the letters and the demo is not able to visible properly() tell me what can i do? I’m a musician with a recording studio. I love my iPhone for most everything in life except its unwillingness to play with Microsoft Windows devices. The only two options I have for getting my studio mp3s onto the iPhone are launching iTunes on my Windows PC and connecting to my iPhone’s Music Library, or emailing the mp3 to myself and playing it inside the mail app. I choose the latter because connecting an iPhone to my car’s USB port is always interpreted by the vehicle as “Let’s begin playing music from the freshly connected device. Surely that’s why someone connected an iPhone to me.” That’s another feature I wish I could disable, but I’ll save that for another post. Anyway, I like leaving the iTunes Library empty. For whatever reason, I’ve found that some of the emailed mp3s do find their way to the mail account’s Trash folder without my involvement. At first, I questioned whether or not it was me doing this inadvertently, but this has happened too many times now for me to believe that it’s me doing it. If I catch that it’s happened within the window of time mail is allowed to sit in the trash bin before it’s purged, I can rescue it back to the Inbox. Otherwise, it’s gone until I resend it to myself. One thing I did do that seems to be working against this, I created a gmail folder for my work and now anytime I send myself a song, I immediately move that email to the special folder. I’ve never had an email get deleted from the user created folders—only from the Inbox.